If you are a resident or visitor to San Francisco or New York, you’ve probably heard of Bouchon Bakery. If you are a foodie anywhere, you at least have a passing familiarity with the name The French Laundry. You might not pay much attention to its sister restaurant, Bouchon Bistro – unless, of course, you’ve had the pleasure of visiting its Beverly Hills or Las Vegas incarnations. And that’s a shame. 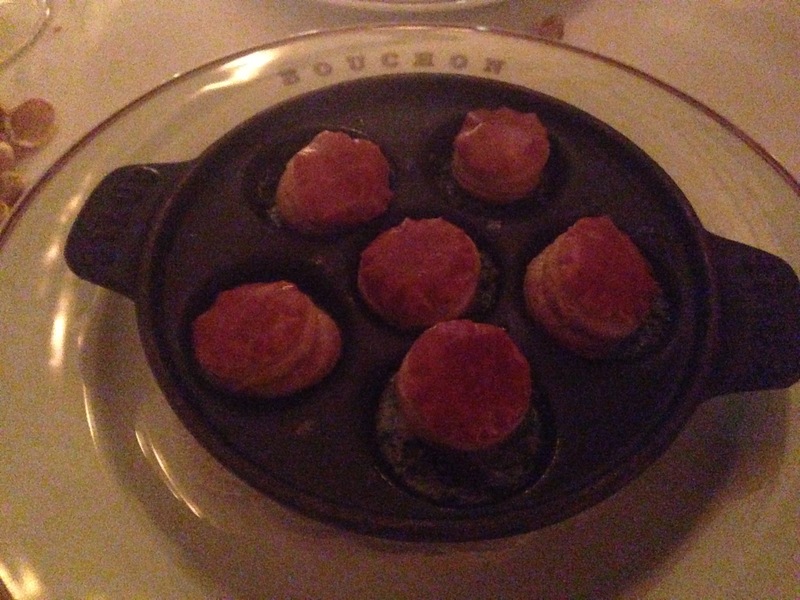 Because Bouchon is exceptional, yet (relatively) accessible French comfort food that shines in its own right. Scoring a reservation at chef Thomas Keller’s The French Laundry is a distant dream of mine. The restaurant has been labeled America’s best restaurant by some. Their prix fixe menus and wine pairings are the stuff of legend. Strategy (and a willingness to fork over a premium for their pricy meals) is critical. And too much effort for me thus far. 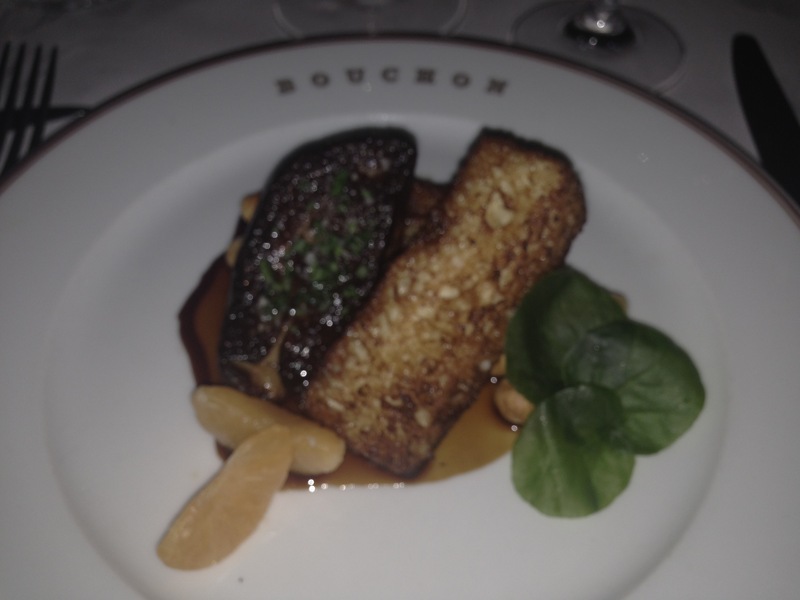 But after an acquaintance in the restaurant industry claimed that Bouchon Bistro was his favorite restaurant in the San Francisco Bay Area, I knew I needed to try it. So I booked a Thursday night reservation for three people – two weeks in advance, mind you. So let that be a reminder to make reservations well in advance! Bouchon is located about 15 minutes’ drive north of the city of Napa in the quaint (but very bourgeoisie) town of Yountville. Yountville must have one of the highest concentrations of fine restaurants per capita in all of the U.S. Though options are plentiful, tourists and locals flock to Bouchon Bakery by day and, the fortunate few, to adjacent Bouchon Bistro by night. Walking through its unassuming entrance, one immediately is transported from California to France, with deep red hued walls, classic (but classy) French decor to include an antique clock, and the obligatory chalk menu board (for specials). A knotted Bouchon Bakery baguette awaits diners as they are seated, as does an extensive cocktail and wine list with an abundance of good French and Californian wines. But the daily special red wine “by the carafe” is a great deal. We paid $50 for 1 L of California Cabernet Sauvignon, which by French bistro standards for house wines would be ridiculous, but by fancy American standards was a more than decent wine for a decent price. 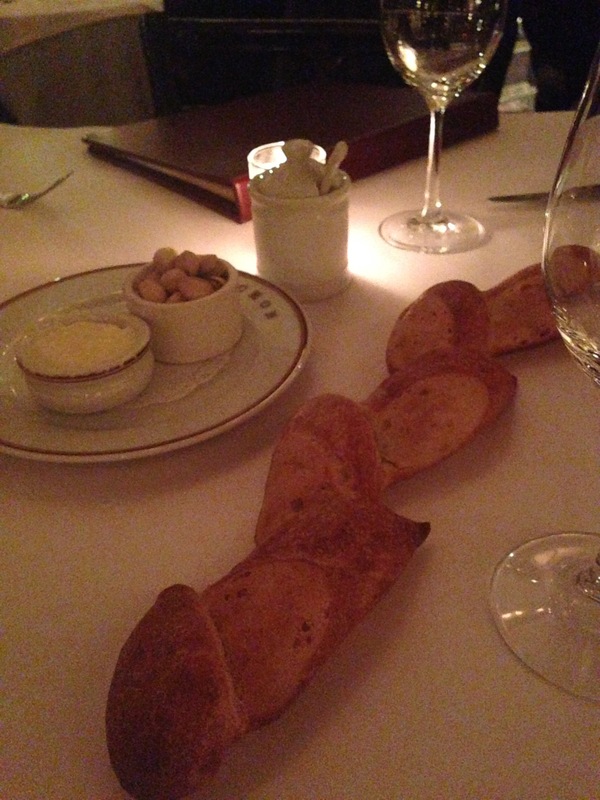 We devoured our baguette with wine as we awaited our appetizer – escargots. This appetizer was delightful – the snails removed from their shells, drowned in mini pots of garlic and parsley butter, and topped with possibly the world’s tiniest puff pastries to help soak up the butter. I missed having the shells as part of the presentation, but not for long once I tasted them. They were well cooked and not at all tough, and the garlic butter was in perfect balance. In lieu of a main course, one of my friends and I decided to order each a salad and a starter. But these weren’t just any run of the mill dishes; they are my two favorite French standards, each with Bouchon’s interpretation. The traditional salade chèvre chaud took a lighter touch than the oft overdressed French version. Instead of pungent, double creme goat cheese, Bouchon used a single medallion of a more crumbly, young Californian cheese. 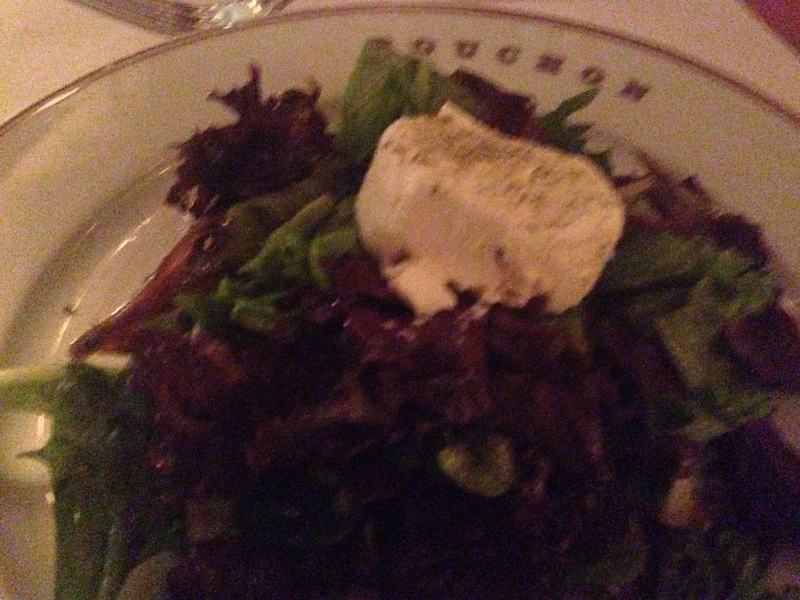 While I prefer the texture of a melting double creme, Bouchon’s salad was a delicate revelation. And the appetizer? Foie gras, of course. Foie gras is easy to do poorly. Did I expect mediocrity? No, but the precision with which the smooth, intense portion of foie gras was seared, paired with a single stick of savory pain perdu (French toast) expertly battered and seared, married with a sweet-tart rhubarb coulis was mind-blowing. 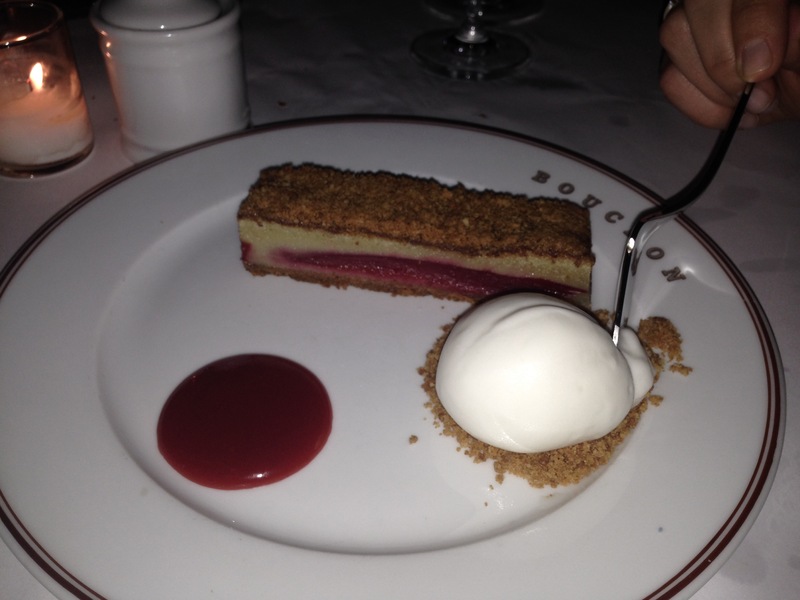 It is the second-best version of foie gras I’ve ever tasted (read about the best here!). 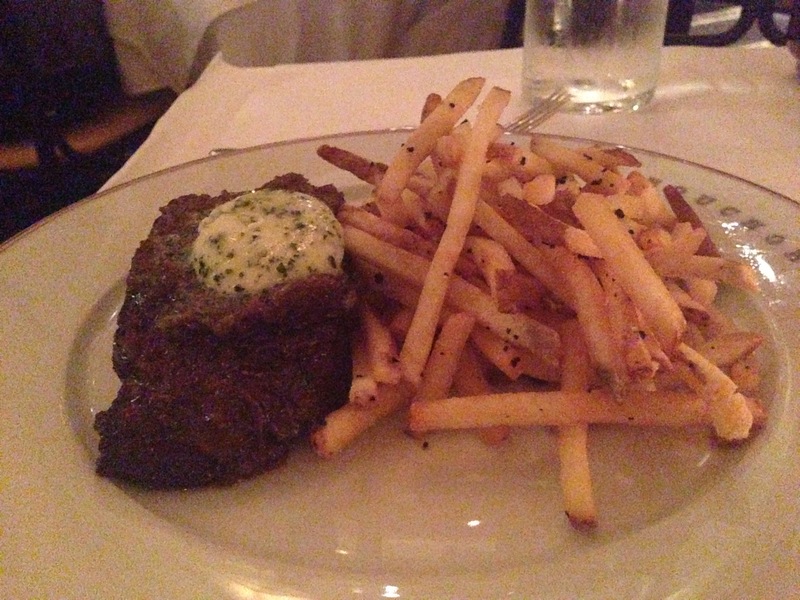 Our other friend ordered steak frites, and we swiped more than a few shoestring fries from the heap that accompanied the juicy meat. We couldn’t resist dessert, so we all shared the most unique offering: a rhubarb Napoleon with tart creme fraiche ice cream. It was a wonderful combination: fruit and cream, sweet and tart, with a hint of pastry. Though our reservation came at the end of the night, our service was on point, as fresh and hospitable as if we were the evening’s first guests. Whether you choose to visit Bouchon for a romantic evening, a celebration, or simply to share in the joy of French cuisine with a hint of California, you will not leave disappointed.